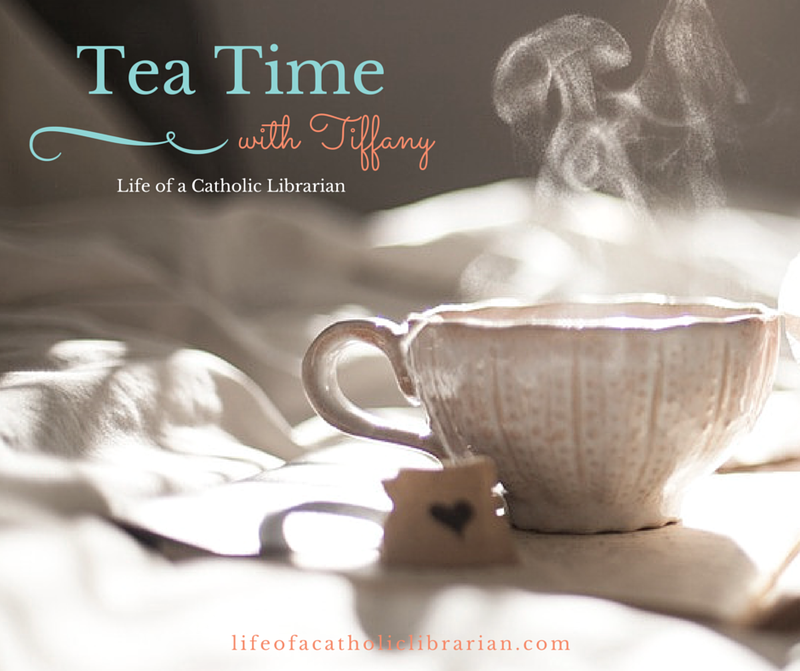 Life of a Catholic Librarian: Tea Time with Tiffany #56 - Summer novenas, holiday knitting, birds & blogging: What do all these things have in common?! Tea Time with Tiffany #56 - Summer novenas, holiday knitting, birds & blogging: What do all these things have in common?! Today I talk about July novenas, my summer knit-along progress and holiday crafting list, some drama at our backyard bird feeder, and why I started (and keep on) blogging. Join me! Pray More Novenas, for monthly novena emails. Busy, crafty plans - The 0fficial Christmas in July 2016 post! Are you praying any summer novenas? Planning your Christmas crafting list, or otherwise crafting anything new this summer? Do you have bird feeder advice, please, I beg you. :0 And do you enjoy writing? What is your motivation in doing so? I'd love to hear from you! Hi Sam, LOVE YOU, GIRL!! You are one of the reasons what I do here is so meaningful. <3 To me, a blog, podcast, or social media experience is about *community*. And relationships. If I didn't have those things, I wouldn't continue on writing. Hello Tiffany, I am the library lady from Canada who devotedly follows your blog but I only comment occasionally, only because so busy and then I forget. But I love your blog because it is every day life, and your faith shines through in such a positive way, but you are real, and I feel I am meeting a good friend for coffee and chat about our daily lives, and love that it is from a catholic perspective. Not sure I can help with your R problem. We once had one in our yard back in the UK where I am from originally, and we had to call the R man who came and sprinkled stuff on the ground. As for novenas at the moment my favourite one is a small Glory Be novena to St Therese as is simple and quick, and also because I love her so much, roses arrive when desperate in any forms, sometimes a picture with a rose, a box or a cake tin, but arrive it does, and I know she is with me. Wishing you a good week ahead and yes I too love St Kateri, thanks for reminder of Feast Day about to happen. God bless your blogging, you are a true inspiration. I enjoy writing; I love telling stories. I keep telling myself to get back to working on my novels but it's just not happening right now. But maybe if I can start blogging more consistently, that will show me the way. I really admire how you set aside time to do this on your blog! I'm praying the novena to Our Lady of Mt. Carmel which is a special devotion in our family and my parish. CLARE ANN, you always make me cry! :0 Thank you so much, dear one! Thankfully, our "friend" has vacated our backyard, we haven't seen him in a full week. I am breathing a heavy sigh of relief on that one. (that's the good 'R' word ;-)). I was talking to a friend of mine who also has bird feeders, and she suggested that it may be the type of food I switched to to attract the woodpeckers. Going back to the old blend as well as thistle seed for the finches. Our friend is likely to not be attracted to those! And St. Therese, YES! I love her chaplet as well, one of my favorites every single year! Hi Kate! Indeed, I very much relate. Writing is such a creative outlet for me. I do find blogging to be a good springboard for other writing. I am super excited to hear that you are working on writing a novel! Keep us posted on that one. :) What is the premise? Our Lady of Mt. Carmel - another perfect novena for July! Did you see that the St. Anne novena is coming up? Starts July 17th! As others before me have already said, you keep it real and relatable. I also love reading the comments. :) It's very helpful to me to know that others have the same concerns, worries, fears, joys, ... We're all in this together. The community here lifts each other up in prayer and supports each other. I love you all! "MOOOOMMMMM! Could you COME IN HERE!!!"